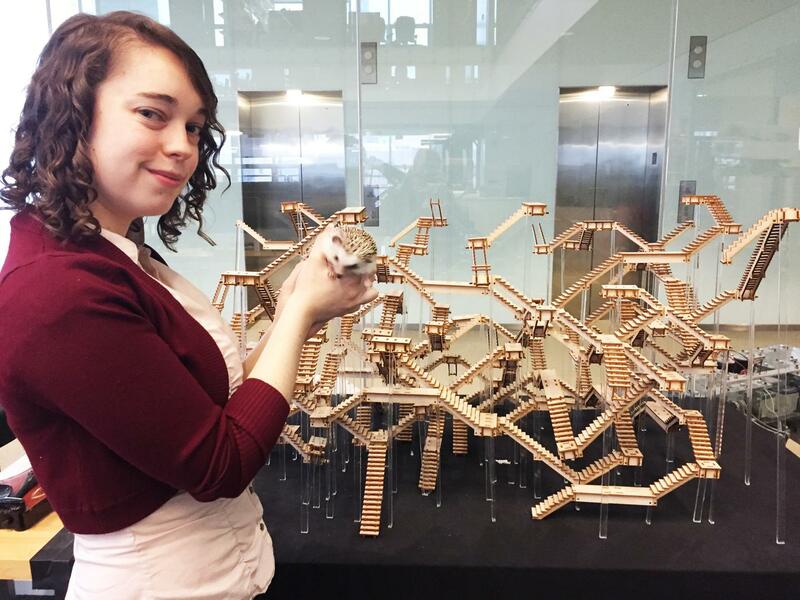 Rébecca Kleinberger, holding her hedgehog Petit in front of the Opera of the Future project, Passerelles. "Hi, I’m Rébecca Kleinberger. I’m a PhD student in Tod Machover’s Opera of the Future group. I work a lot on using the voice as a tool for self-reflection, trying to see how we can use that to create interactions that are more deep and meaningful between people. I like to think of the voice and all the sound from our bodies as some kind of rhythm of life and music of life. So, music is definitely at the core of what we’re doing. But we also have a very wide definition of what music is. The group is very pluridisciplinary, and everyone has very interesting personal views on what to incorporate in music. Some people work a lot on noise music, on silent music. And I like to think of the voice and all the sound from our bodies as some kind of rhythm of life and music of life. Media Lab is a really great place. I came in 2010 for an internship and I swore I would come back. The freedom we have, the interdisciplinarity, but mainly the inspiration from all the people around. I like spending all-nighters at the Lab working with friends finishing a project. I like just general chat in the corridor to think about new ways to mix different disciplines with all the friends, to create new projects. It’s really unique. Postscript: Rébecca is involved in the Philadelphia Voices project, which is the latest in the Opera of the Future group's City Symphonies series. Since last spring, the team has been collecting music and sounds from people across Philadelphia to create a sonic landscape of that city. Tod Machover, who heads Opera of the Future, is now composing a symphony inspired by those sounds—a symphony that will delve into the current state of our democracy from Philadelphians' perspectives. The world premiere of Philadelphia Voices, performed by The Philadelphia Orchestra and several choirs, will take place April 5-7 in Philadelphia; its New York premiere will be at Carnegie Hall on April 10. For the project, Rébecca conceived and designed Nebula, a web-based application based on a platform provided by fellow Media Lab researcher Akito van Troyer in collaboration with Machover. With Nebula, you can conduct a choir composed of diverse voices from Philadelphia using your own voice. You can explore and mix the voices by singing, talking, and vocalizing into the microphone on your computer.